My son , Jasper, and I went on a food expedition in Hanoi this past summer. We ate at least four times a day in order to cover all the ground. My son took me to his favorite pho place, called Pho 10! Hanoi pho is different from pho you find in Seattle which is basically from the southern part of the country. There was no hoisin or Sriracha on the table. It is served with some kind of hot sauce and pickled garlic. You can also order Chinese fried bread to dip in your pho, delicious! I am a sucker for both hot sauce and garlic so I was in heaven. We went there at least twice, including a visit for our last meal. In Thailand we also have variety of beef noodle, but 20-30 years ago, there was no pho there. In Thailand, noodles are always adorned with all kinds of condiments, fried garlic, salted cabbage as well as array of other condiments on the table for you to fix your noodles to your liking: fish sauce, sugar, peppers in vinegar, dried chili peppers, etc. So when I encountered pho for the first time, I felt something was missing. But now I do appreciate its clean flavor and simplicity. I love all kinds of noodles. If I didn't, I would probably be 10 lbs. lighter. I need to feed my addiction from time to time. Pho is one of them. Of course, I do go out and eat pho at my favorite spot near my house. But when I really in the mood for pho, I will make my own and eat it for days to satisfy my craving. Making pho is not difficult but it's time consuming. The broth needs to be cook for hours to coax all the flavor out of the bones. Pho is as good as your broth. The broth needs to be rich with a hint of sweetness (not sugar sweet!) from the bones. Some restaurants add too much sugar to their broth because sugar is cheaper than bones. Yes, you do need some sugar but it's not your primary flavor. You should not taste the sugar ideally. Like I said before, to make pho broth is time consuming so when I make it I make a lot, enough to last for a whole week. If my son is home, it probably lasts 3-4 days. I will eat it at least twice a day. 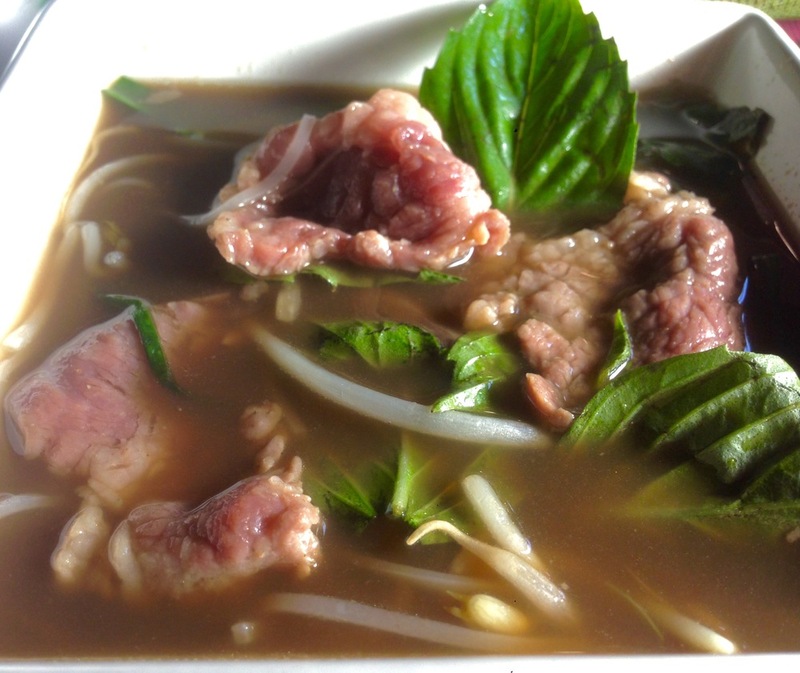 Once you have the broth, it takes no time to make a bowl of pho. When my hunger strikes, I am so grateful to have broth in my fridge! I use my biggest pot in the house, 17.5 quart size pot but I don't think many people will have one. But use the biggest pot you have, at least 10 quarts. Good broth starts with good bones. Use grass fed beef if you can. I normally combine two kinds of bones, knuckle and neck bones. Ox tail would be so good in your bone broth. You can also throw in a piece of brisket but I prefer my pho with barely cooked meat and some meatballs. I usually end up with two-three cups of bits and pieces of meat and connective tissue from the bones. That's enough cooked meat for me, I don't need more. To get crystal clear broth, you need to blanch the bones and meat. For a 10 quart pot, I use 5-6 lbs of a combination of bones and meat. You can use shin bones, knuckle bones, neck bones, oxtail, and a piece of brisket, flank, or chuck if you like. Put all the bones and meat in a big pot, cover with water and boil for 10-15 minutes. You will see scum and foam float to the top. That's a good thing. Take the pot off the heat, throw away the dirty water and clean the bones and meat to get rid of all the debris and blood. Clean it well so your broth will be clear. Of course if you don't, the broth won't be very clear but it will still be very good! So don't worry too much about it. Put all the bones and meat in a big pot, add enough water to cover generously, about 4-6 inches above the meat. If you add too much water, your broth will not be as rich. Now you need to flavor the broth. First start with two medium onions, peeled, and a 4-5 inch piece of unpeeled ginger. If you use unpeeled onions, your broth will be richly brown, which is good too! But if you want golden color broth use peeled onions. You can roast the onion and ginger on an open gas flame or broil them in the oven if you want. I tend to skip charring onions because I don't want bits of burnt onion pieces in my soup but I do char the ginger, which I cut in half horizontally and lightly char on both sides. Put the onions and ginger in the pot, together with a six inch piece of Chinese radish (same as daikon), cut in half crosswise. This is a trick I learned from my Thai cooking. Chinese radish imparts subtle sweetness to the broth. But don't overdo it because the radish flavor might overpower your bone broth. You don't want that in pho. Now, spices! Cut a 6 inch square piece of cheesecloth, put in a piece of cinnamon stick, 1 teaspoon each of white pepper, coriander, and fennel seeds, 5 star anise, 2 cloves, and tie to close your spice packet with kitchen twine that is long enough so you can tie it the pot handle. This will make it easy for you to fish out your spice packet later. Do not use a coffee filter for this, it will not survive the long simmering process. It is annoying to have to fish out all the spices from the broth. or you have to strain your broth. I did that once and won't be making the same mistake again! Now add 1/4 cup of fish sauce, 1 tablespoon of salt, 1 tablespoon of raw sugar (I use maple syrup) The broth can be flavored later so be conservative at this point. Now put the pot on high heat. Your broth still needs your undivided attention at this point if you want clear broth. Let the water come to boil and skim off all the foam and scum that you see. It should not be that bad since you have already blanched the bones. After five minutes or so, turn your stove to low. It should be on low simmer. Keep checking your broth every now and then and get rid of any foam or scum that rises to the top. After half and hour or so, you will not need to do this any more. Just keep simmering your broth away, adding a cup or so of water to replenish it from time to time. In the end, you should end up with 4-5 quarts of broth. After two hours, take out your brisket or flank steak, if using. Your meats should be fork tender. You can also remove the meat from oxtails and shin bones but check for tenderness first. Then add the bones right back to the pot and keep cooking for at least 4 hours more. The broth will get darker the longer it cooks.I tend to cook it overnight since I cook it in a very big pot and I put in enough water to make sure not to burn my house down! I did this once in an 8 quart slow cooker cooking on low overnight. This is a safer way to slow cook the broth overnight. The broth will not be as clear but still very flavorful. Best of all, you can rest well all night. I had a close call one time, forgetting to turn the heat to simmering low. I woke up in the middle of the night and rushed down to my kitchen to discover my broth boiling away vigorously. Both my house and broth were safe but it was a close call indeed! Whew! When your broth is ready, take out all the bones, onion, ginger, and the spice packet tied to the pot handle. Remove all the meat and connective tissue from the bones and save it if you like. Taste the broth again. It should be flavorful at this point. You can strain your broth but I normally don't because I don't want more things to wash! Add more fish sauce and raw sugar to your liking. Remember it should not be overwhelmingly sweet but sweet enough to make a well rounded great tasting golden elixir. Now you are ready to make a bowl of pho, better than any restaurant's pho. You need rice noodle (fresh or soaked and drained dried rice noodle), beansprouts, basil, lime wedges, jalapeno, hoisin sauce, and Sriracha sauce. If you use dried noodle, make sure to soak it in warm water, not hot, for about 30 minutes, and then drain. For beef, I don't care much for round steak normally used at Vietnamese restaurants. I tend to use more flavorful thinly sliced meats, i.e short ribs, sirloin, or chuck. I like to marinate mine first in some best quality oyster sauce for at least a few hours (about one tablespoon per i lb of beef). It tenderizes and adds a bit of flavor to the meat. That's my Thai upbringing. We flavor everything under the sun!! You don't have to but at least give it a try and tell me how you like it. You have two ways to cook your noodles. One is to cook it in boiling water until it's soft (not long! ), or just put it in a microwave on high power for 1 minute. Now cover your noodles with raw beef, plain or marinated, and ladle boiling hot broth over the meat. Serve immediately. Now from here, you know what to do, right? It's time to reward your patience. It's time consuming but it's all worth it. I hope you agree! Golden color broth bubbling away!